That’s a difficult question to answer, as very little work has been conducted to date on acting for television. However, the work of Cynthia Baron, Sharon Marie Carnicke, Carole Zucker and Roberta Pearson on film performance was inspirational – particularly Reframing Screen Performance (Baron & Carnicke 2008), In the Company of Actors (Zucker 1999) and Eloquent Gestures (Pearson 1992). Definitely – both geographically (being given a rare glimpse of the BBC’s old Alexandra Palace studios, making behind-the-scenes visits to Television Centre when it was still a going concern) and in terms of the at times bizarre facts unearthed (some of which were not suitable for publication, I’m afraid). I enjoyed every aspect of writing the book, from re-viewing the case studies to poring over archive documents, but perhaps the most satisfying element was the interviewing process. It was fascinating to have my theories challenged by the practitioners who originally worked on my case studies, and offered their own unique perspectives. Letting go of it: the temptation is always to continue tweaking and refining. However, the ever-changing nature of the subject matter means that it will be ripe for re-visitation a few years down the line. I have in the past published several journal articles and chapters in edited collections, but this is my first full-length monograph – and, I hope, not my last. MUP are very strong on television studies in general, and especially British television history. They have published many of the key texts I use in my teaching and research, in particular the Television series and the work of Jonathan Bignell, Sarah Cardwell and James Chapman – so I knew I would be in good company. I was working on the book concurrently with various other projects over a couple of years, so it was always possible to ‘turn the canvas to the wall’ and return to it refreshed (which is not always the case). And – while I’m proud of my other work – this is the publication that most fully investigates my theories and research interests, and is therefore the most satisfying. 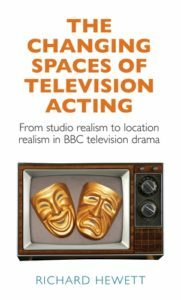 I am keen now to apply the methodology and methods employed in The Changing Spaces of Television Acting to unpack developments in sitcom performance, where the shift from multi- to single camera (and, in recent years, back again) has, if anything, had an even more pronounced effect on acting and directing than in the field of drama.